I had a great question from one of the moms who is reviewing the new Medieval and Renaissance Art and Music Appreciation plans. She is using option two which includes going through Mark Kistler’s Draw Squad book and then applying the drawing element to the painting in option one. Note: This entry includes Amazon affiliate links to a book that I own and have used with my own family. If you are not using my art plans, you can still apply these ideas to whatever drawing and picture study plans you are using with your children. It is a rather simple concept but a very powerful tool. Here is a link to view a sample from the ebook and to have a better understanding of how I connected the Mark Kistler drawing lesson to the painting that is viewed in option one. 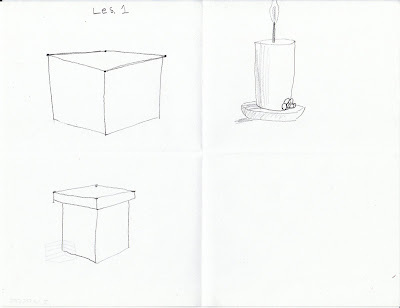 The plans for option two, day two suggest completing Lesson One: Foreshortening in Draw Squad. 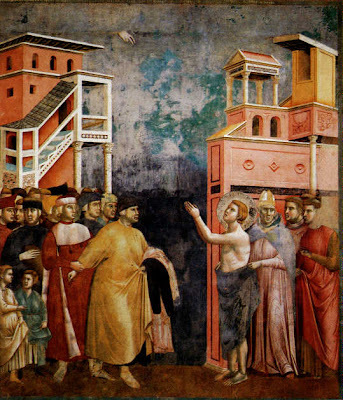 After you finish the lesson, I suggest viewing the painting by Giotto, Life of St. Francis, Renunciation of Wealth and look for the shapes and angles. After viewing the painting, I suggest having your child draw a building from the painting using what they learned about foreshortening. Here are some samples from this lesson that my son completed. I talked last week about my idea that art copywork helps train the eyes to see the shapes and art elements that the painter used to solve the problems in making things look real. As you begin the Mark Kistler lessons and then complete the follow-up exercises, you will start to see your child apply immediately the concepts from the drawing lessons. In the beginning, it may help to work alongside your child to help them begin to see how the objects he is drawing in the Draw Squad lessons are applicable to the paintings. You do not need to insist on perfection but a really good try is acceptable at first. Pick a small portion of the painting where you can clearly see the new art concept illustrated. In this particular example, your child could concentrate exclusively on the yellow box-shaped building on the top right side of the painting. Keep it simple and let your child progress at their own pace. As you work through the progressive lessons, I am sure you will begin to see application of the art skills learned in option two of Medieval and Renaissance Art and Music Appreciation. 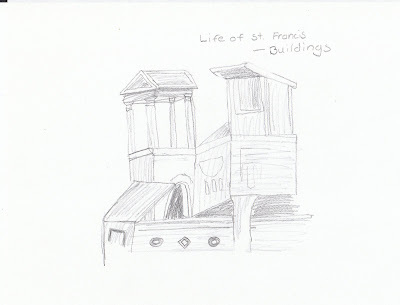 Click the cover image above to read more about the Harmony Fine Arts Grade 6 – Medieval and Renaissance plans.